Part 28 of my series of Kiss reviews, leading up to the release of Monster! As part of their “Hey, let’s try anything!” modus operadi, Kiss decided to record a single with old producer Bob Ezrin. It was all a part of their greater scheme to drop the pop and get back to their rock roots. Working with Ezrin, who produced both their greatest commerial success (Destroyer) and failure (The Elder), was a tentative step to see what the chemistry would be like this time. The single was the perfect chance to test drive the partnership. 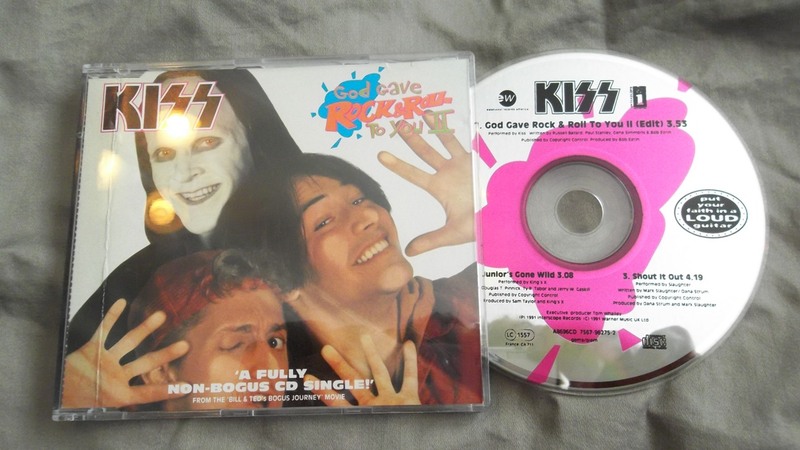 Released in conjunction with the movie Bill and Ted’s Bogus Journey, this new Kiss single was also a first in that Kiss were contributing a brand new song to a movie soundtrack. This version is actually a different mix than that later on Revenge, so this single still is an exclusive of sorts. “God Gave Rock ‘N’ Roll To You II” (my God what a cumbersome title) is a reworking of an old Argent tune, hence the II. At the time I didn’t think much of it, and I still don’t. It’s not a personal favourite of mine. It’s a little slow, although very anthemic and perfect for the live setting. It does feature Gene and Paul singing lead together, a rare thing indeed and a first since…when? A long time anyway. It also has some sweet harmony vocals from Eric Carr…his last recording with Kiss before succumbing to cancer way too young at age 41. While he underwent treatment, Eric Singer played drums on the song. This was all kept secret in 1991 before Carr died; in hindsight you can tell it’s Singer on drums. Carr even gave it his all, playing drums in the music video. The other two tracks were also exclusive to the movie soundtrack: “Junior’s Gone Wild” by King’s X, and “Shout it Out” by Slaughter. Both bands were experiencing increased success and fans were eager for new music. “Junior’s Gone Wild” sounds like something not too far removed from King’s X in-the-making fourth album. “Shout it Out” is a typical Slaughter party rocker, as good as anything on their debut. A bit shrill and and sweet by today’s standards though. Thanks , I’ve just been looking for info about this subject for a long time and yours is the greatest I’ve discovered till now. But, what about the conclusion? Are you sure concerning the source? Hi Logan, I’ve since re-reviewed this, have a look.